The Broken Men Spoken Word Project is an introspective analysis of the current state and role of the black man in South Africa today. Told through the words and voices of a special generation of young mzansi Spoken Word artists, this journey into “Man-hood” dissects various subjects, beliefs and behaviours associated with being a black man in a post-apartheid South Africa. Using voice, music and visuals, Broken Men speak directly to the ‘human’ and the ‘human condition’ by unapologetically tearing through controversial themes including politics, love, economics, brotherhood, violence, sexuality, identity and family. 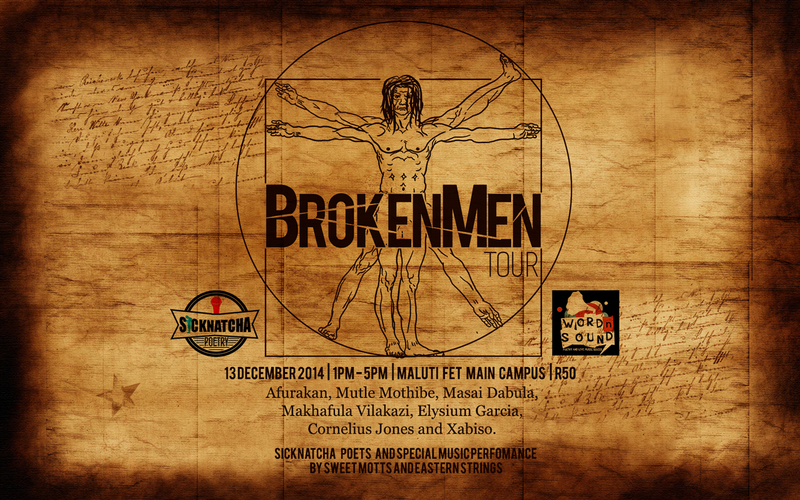 The Broken Men Spoken Word Project will roll out in various formats and stages including live performances, workshops, discussions and debates across South Africa. The project will officially be launched on 13 and 14 December 2014 with Spoken Word performances in QwaQwa and Bloemfontein in partnership with Sicknatcha Poetry and The Archives Poetry. Hosted by Afurakan, the productions will feature performances by Mutle Mothibe, Makhafula Vilakazi, Elysium Garcia and Xabiso Vili.